Nathan 'Dinnerbone' Adams is a game developer at Mojang AB who worked on Minecraft and its launcher. A member of the Bukkit team, Adams was hired by Mojang on 28 February 2012 to develop the mod API. His first day at the Mojang office was 27 March 2012, shortly before the first development snapshots for version 1.3.1. In October 2015 he announced that he would be "taking a break from Minecraft PC development for a few months." Later, in February 2016, he further elaborated that though he would continue on other projects at Mojang, he had left the Minecraft team. 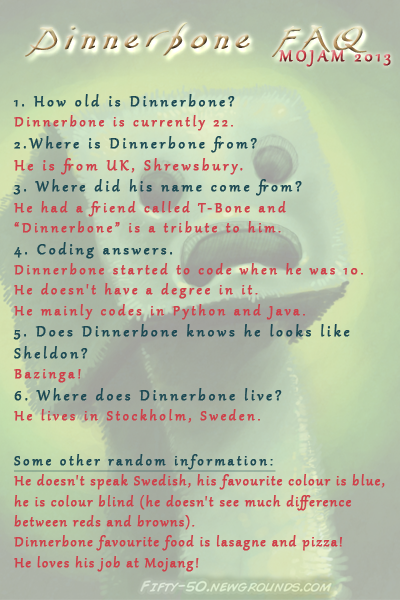 If you name any mob with a name tag with the name "Dinnerbone", the animal will flip upside down. This naturally extends to himself. Same logic applies for naming a mob "Grumm".